Kickstarters Not To Miss: May 2013 Edition! I wanted to pass along some Kickstarter projects that have caught my eye. There's great new game projects launching every day, and we wanted to pass along some recommendations of some projects to check out. Take a look! 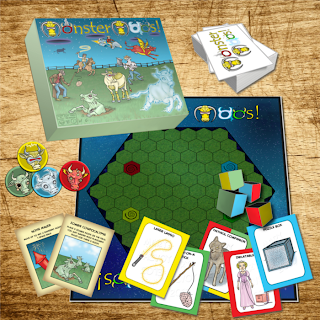 Monster Moos looks like a fun game for the whole family. The designers, whom I have had the opportunity to exchange a few words with the creators, Nathanuil and Dominique DeMille over social media, and they seem really great. I love the idea that the game was inspired by their young son's cow impression! This one ends very soon. Big. Dice. That's it. 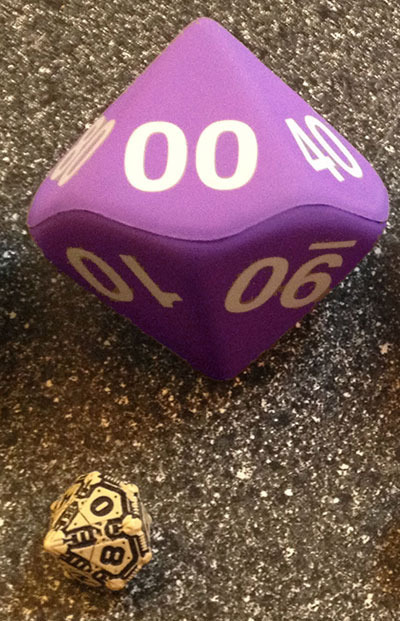 Who doesn't need big foam dice? A great novelty item for a gamer. Nat Iwata, a Portland, Oregon-based artist, has a new set of cards on Kickstarter. He has done a couple of these art card decks already, and I love his illustrations. 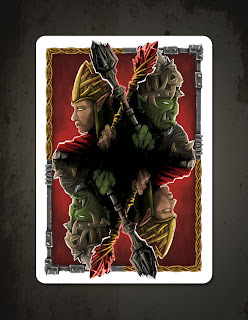 This one is illustrations of elves and orcs. Again, a great novelty gift for a gamer. Even a game of Hearts could get a bit of fantasy flair! The Growing Up Gamers crew loves stories. Jason Tagmire's Storyteller Cards look like an excellent aid for anyone who likes stories whatsoever. A writer, gamer master, whatever. If you're writing or brainstorming, dealing a couple of these could very well get the creative juices running. 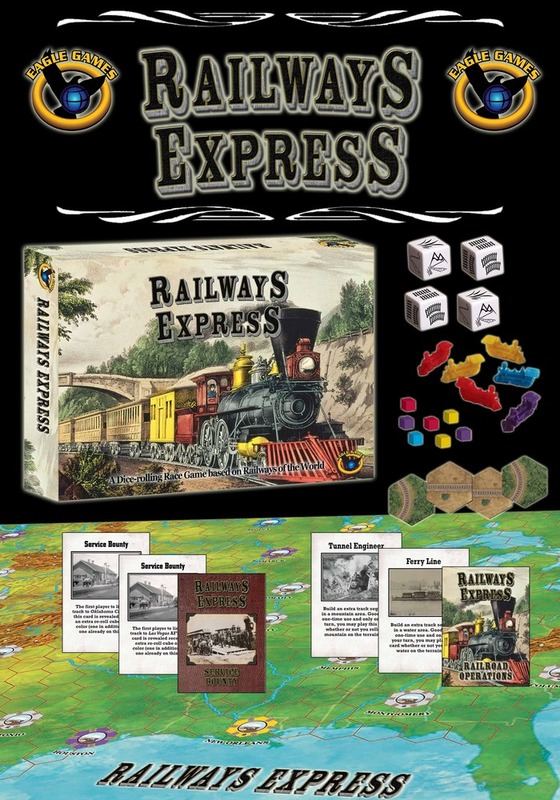 Railways Express: A Dice-Rolling Train-Racing ROTW Game! The Railways of the World series of games is excellent. We did a review of the card game version here. We have played the full version several times, too, and I personally enjoyed it more than a couple other in the genre. 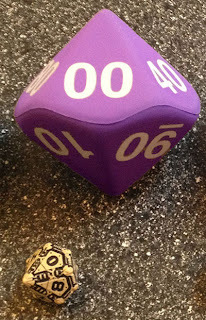 So this is a dice-based version. I really enjoy the lighter dice games every now and then, and a new dicey member of the ROTW series seems like it will land on our shelves sometime. Okay, I am a mini painter. I paint a variety of pewter and resin models, many for use on the game table as representations of characters and monsters in a roleplaying game. When I saw the Fantasy Gaming Figures Kickstarter by Gamelyn Games, I thought, "Wow". 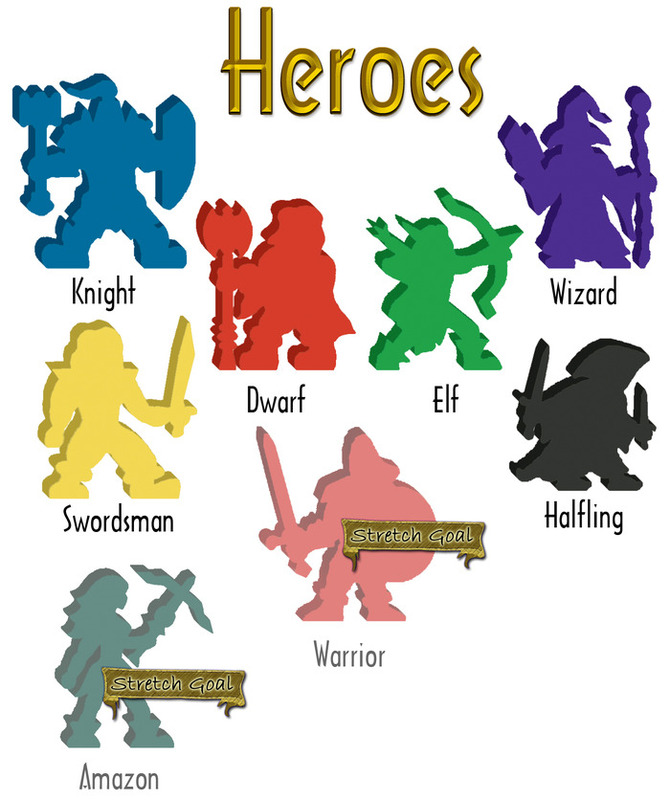 These fantasy meeples look like they would be a great game aid for first-time RPG players. Heck, for any RPG player. These would look excellent on any table. 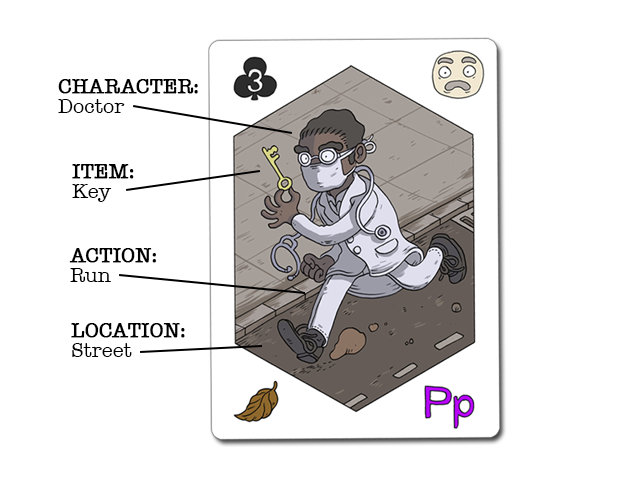 So those are a few Kickstarters I have seen that seem to merit a second look. This is by no means -all- the crowdfunding games that deserve your attention. As a matter of fact, I foresee an interview coming up soon with the designer of Euphoria: Build a Better Dystopia, Jamey Stegmaier. Do you have a favorite on Kickstarter, or have a project there yourself? Let us know in the comments! 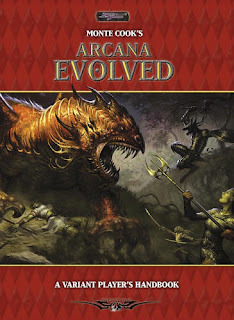 One of my absolute favorite campaigns was set in the Lands of the Diamond Throne, the default setting for Monte Cook's Arcana Unearthed/Arcana Evolved alternate player's handbook. I could gush about that ruleset. It was imaginative, rich, and groundbreaking. It broke from the Tolkien-inspired fantasy that D&D had long been beholden to in interesting ways. In my opinion, this was the first OGL (that's Open Gaming License, the license that allows third party content based on 3rd Edition Dungeons & Dragons) product that really pushed the boundaries. You could say Monte Cook is known for that. But that's another tale for another post. Now I'm going to talk about a campaign I had the pleasure to play in with some great folks. We had an interesting party. There was a Giant Mageblade played by Julian (one of the authors here at Growing Up Gamers), who was a sort of pyromancer. My wife played a Loresong Faen storyteller, a speaker of the dead, who was on a quest to find some artifacts, and our friend Brady's human Oathsworn of dubious morals who had vowed to protect her. In her first roleplaying experience, our friend Shannon played a Quickling Faen Totem Warrior amnesiac with an unknown past. And my character was a Litorian (lion-man) tribesman fulfilling a promise to his dead sister to scatter her ashes at the four corners of the world (I ran a character because I alternated gamemastering with Julian). All great fantasy heroes need great villains. Perhaps the villain I am most proud of making was the primary antagonist of this story, Black Matthias. Well, "Black Matthias" was one of his names, of which he had many. Black Matthias was an ancient and powerful Magister, a practitioner of magics strong and dark. And moreover... he was bored. And you may not know this, but ancient, powerful and bored are a troublesome combination. My inspiration for this guy was a song by Tom Waits, and, to some extent, the musician himself. 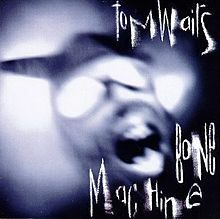 The song, Black Wings (from the CD Bone Machine), tells a story of an implacable adversary, perhaps the devil himself, incapable of being imprisoned, appearing in dreams, and stealing away his promises. 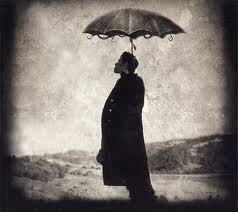 If you haven't heard of Tom Waits, or listened to this song, I encourage you to do that. On a side note, the musician himself is also an actor who has likely appeared in movies you have seen. But I digress a bit. The heroes became acquainted with him at the end of their first adventure. He showed up in a carriage drawn by skeletal horses to complain about them thwarting his scheme to get a woman lynched by the townsfolk of a backwater village called Lazy Eye. Unbeknownst to them, the whole thing was a bit of a sham to test them, and to see if the faen amnesiac, Laura, had any recollection of him. Then, after brushing aside a few sword blows from the giant, he climbed back into his carriage... which promptly dispersed into a huge pile of maggots. Yes, he was very theatrical. I'm not sure the players knew what to make of him. From the moment he stepped into the campaign, it was clear from the start he wasn't a good guy. I believe his first line, delivered in his characteristic gravelly rasp, was, "Alright, children... pin your ear to the wisdom-post, 'cause I'm only gonna say this once...". So their first interaction was to get a lecture from a man in a crumpled hat and a suit that appeared to have slept in for days, discussing the inconvenience and impracticalities of having to re-plan the things they've messed up. No threats, no maniacal laughter... not even hostility, really. So... the other faen woman in the campaign, Kyra, was on a quest for some artifacts called the Sakkar Tolmen Stones [Note: this bit was borrowed from the now-defunct website, DiamondThrone.com, by a user called Black Moria; I'll gladly credit the author if anyone knows him]. In this campaign, these were six smallish crystal pyramids, each corresponding to the six elements of magic: fire, water, earth, air, the green and the dark. Notably powerful each on their own, when put together, they formed a cube of significant power, and unlocked the secrets of their creator, a Magister of the distant past named Sakkar Tolmen... can you see where this is going? Sakkar Tolmen, in times before the coming of the Dramojh, was a Magister of great power. Aware that his mortal frame would eventually fail him, he devised a plan to achieve immortality and great power. He encased a piece of his soul in each of these six stones (much like a lich would in a phylactery), which he then enchanted into six powerful artifacts. 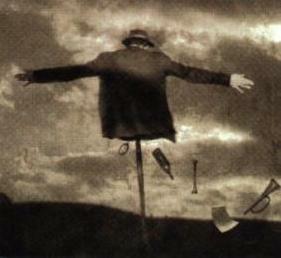 Then... he did something of pure genius: he gave them away. Powerful magisters rarely give away powerful things, or cooperate with each other. Sakkar Tolmen counted upon this to keep the stones from ever coming back together. But this was not enough. His soul was safe, but he needed raw life-force to keep him from living forever in a desiccated husk. He needed a soul anchor. In terms of the Sakkar Tolmen curse, a soul anchor is sort of a host for Sakkar to feed from, indirectly. After a ritual upon a young creature, that creature enters a symbiotic relationship with him. The details I'll go over in part 2, but the host effectively has a slight Constitution penalty, but gains a slightly longer lifespan. Sakkar, in addition to being "living", may treat the host as an origin for spells and scry upon her pretty easily. A good way to protect one's investment, eh? So along their journey, the heroes uncovered, bit by bit, pieces of information about Black Matthias. Kyra's research of Black Matthias kept going further and further back. In the Free Cities of the South, he was immortalized in a children's rhyme as Blackbag, a bogeyman-like entity who stole children. In the capital, old records of the times of the coming of the Dramojh told of a wicked arms dealer and war profiteer, captured and tried, yet who inexplicably laughed off every punishment and execution attempt... before walking out of the prison, never to return. More answers, more questions. Laura, it was eventually revealed, was the current soul anchor. Bits of memories came back to her in dreams. Forgotten friends revealed themselves to her. Cryptic hints were dropped in encounters where Black Matthias allowed himself to be seen. It was really fun unfolding this story and leaving breadcrumbs of clues lying about. In part 2, I'll hash out the template for both Arcana Evolved and Pathfinder! In part 3, I'll describe the Sakkar Tolmen Stones! In part 4, I'll stat out the man himself! The Growing Up Gamers crew would like to wish a very happy birthday to its own Angela Hickman Newnham, gamer mommy extraordinaire! Rumor has it that Angie will be celebrating her big day playing some Magic: The Gathering. Care to join us in wishing her a happy birthday? Here's how! 1. Leave her a comment below! 2. 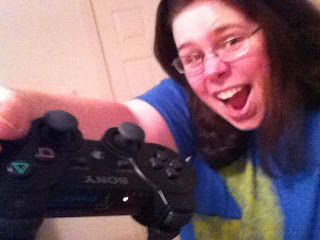 Tweet her a big happy birthday; she's @growingupgamers on Twitter! 3. Leave a message at the Growing Up Gamers Facebook page! We hope you have a great day, too!